Anyone can get arthritis, including children and young people. In Australia one in six people have arthritis. Many people think arthritis is a normal part of getting older; this is not true. 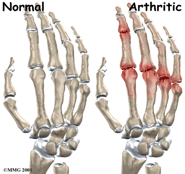 In fact two out of every three people with arthritis are between 15 and 60 years old. Arthritis can affect people from all backgrounds, ages and lifestyles. General symptoms such as tiredness, weight loss or feeling unwell. Is my sore joint arthritis? Comes on with swelling, redness and warmth of your joints. How can I find out if I have arthritis? See your doctor as soon as possible if you have symptoms. Your doctor will ask you about your symptoms and examine your joints. They may do some tests or x-rays, but these can be normal in the early stages of arthritis. It may take several visits before your doctor can tell what type of arthritis you have as some types of arthritis can be hard to diagnose in the early stages. Your doctor may also send you to a rheumatologist for confirmation. ects people in different ways, treatment has to be tailored to the needs of each person. It is important to work with your healthcare team to find treatments that suit you. Jude Holroyd is the Principal Physiotherapist at our Jordan Springs practice. *to help you stay active – look at our stretching program and our core program. PreviousPrevious post:ACL – What Is That?NextNext post:Arthritis Part 2 – Is Exercise Good?